Strengthening the family bond can prove to be challenging even for the most dedicated parents. One of the best tools to achieve this goal is holding a Family Meeting. 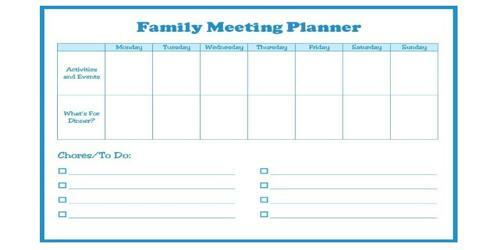 Is it even essential for families to hold a meeting or even consider preparing a family meeting agenda? The days when family members got together around the dinner table and discussed any issues of the family on the spur of the moment have long gone past. The Family Meeting is about communication, which will lead to better connections between family members, and it’s much easier to communicate when you’re having a good time. Presently a number of successful families are encouraged by churches and even psychologists to hold family meetings every week in order to solve problems, clear misunderstandings and instil the culture of the family in younger members. The family meetings create a positive environment in the family and children learn too much in these meetings. People may consider these subjects as minor which can be resolved without the need of having a family meeting. However, if they consider how they can improve understanding between themselves and even build unity they will understand that family meetings are not only important but will also begin to hold them after preparing a family meeting agenda. However, meetings of all types for which an agenda is prepared must ensure that other members attending the meeting have been given the time needed for the preparation and therefore an agenda even for family members must be prepared at least a couple of days in advance. It helps your children to learn the values as well as make themselves mature. These meetings are a great way to improve communication as well as create transparency between family members to make your relationships more affectionate. The member of the family who has decided on holding the meeting is likely to have a certain subject in mind which could either be for the benefit of the family or even relate to an issue which needs to be solved at the earliest. The family member must make it a point to provide the reason for calling the meeting and the kind of information that will be shared must be disclosed. A family meeting must involve all members of the family with the exception of the toddler’s who will not be in a position to add value to the meeting. The responsibility of writing the family meeting agenda will rest upon the member of the family who has suggested the meeting. It may be a senior member of the family or even a young adult who may have concerns to discuss or information to share. There is a need for the organizer to understand that all subjects in his or her mind need to be discussed and done in the best manner possible without hurting the feelings of the others.